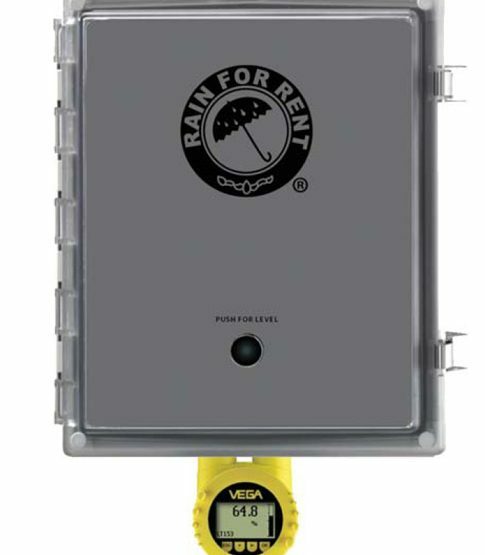 The portable Radar Liquid Level Gauge from Rain for Rent measures liquid levels (dielectric of 3 or above) with a non-intrusive 26 GHz radar signal. Monitoring, measuring liquid levels in portable and fixed tanks are easy with the portable radar gauge. Accuracy is ± .12 inch of liquid with a measuring distance of up to 99 ft. The analog signal output can be used to control process instruments and VFD’s. Does not have to touch fluid it is measuring. Can measure the level of many liquids regardless of specific gravity. 5º F to 176º F operating temperature. Scaling of the Radar Gauge can be done with no fluid in the tank.